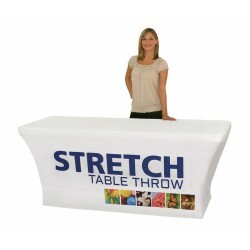 Table covers and table runners are a great way to enhance your trade show presentation and lend a polished appearance to your entire display setup. 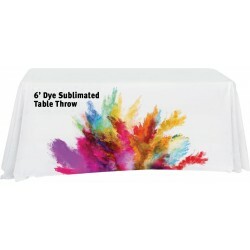 Solid color table covers are available in 11 colors and are made of 100% polyester. Our custom printed tablecloths and table runners are dye sublimated on knit polyester for brilliant color and ultimate durability. They are machine washable and wrinkle resistant. 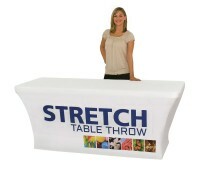 We offer table throws for 4 foot, 6 foot and 8 foot tables, as well as a convertible model that adjusts for either a 6 foot or 8 foot table. 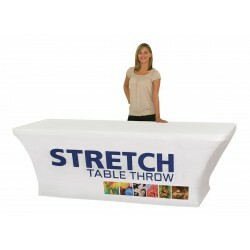 Our table runners come in 24 inch, 30 inch, and 60 inch widths so you can find the right size to display your message. Some styles of table covers and table runners are available in full size as well as the economy versions that don't cover the back side of the table which allows for easy access from the back to any materials stored under the table, and cost less because they have less fabric.